It’s the kind of devotion usually inspired by rock stars. But Sung Hyun Park, the subject of this adoration, is not a musician. Park is a golfer, albeit one whose talents are deemed so extraordinary by some that they are attracting a legion of dedicated fans in her native South Korea. Her breakthrough win came at the 2017 US Open, a major success she backed up with victory at this year’s Women’s PGA Championship. And her triumphs are making an impact back home. Moh and Kim are not lifelong golf fans; they have both been drawn to the sport by Park’s achievements, part of a 10,000-strong, flag-waving fan club. Park, Moh and Kim have all traveled to Evian, a town in the shadow of the French Alps which sits on the shores of Lake Geneva. It plays host to the Evian Championship, the fifth and final major of the women’s golf season and another chance for Moh and Kim to catch a glimpse of Park in action. Moh admires Park’s “powerful, gorgeous swing,” and says she is the reason why she started playing the game. She used to follow Park all around Korea and, now her idol plays mainly abroad, tries to attend the majors. Kim first saw Park on TV and thought, “wow.” Her face lights up as she recalls her trip to Trump National Golf Club in New Jersey for last year’s US Open. Park is part of a Korean vanguard. As of September 10, 38 Korean golfers sit inside the top 100 of the women’s rankings, with five inside the top 10 and seven inside the top 20. Since 1998, Korean women have won 28 major championships. The country boasts its own thriving golf circuit, the LPGA of Korea Tour, and, according to Moh and Kim, the women’s game is more popular than the men’s back home. It’s a view backed up by Mike Whan, commissioner of the US-based LPGA Tour which is seen as the elite women’s golf circuit. 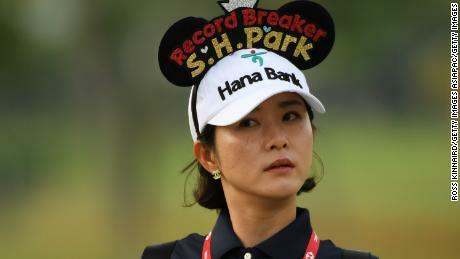 He suggests this explosion of Korean talent was triggered, in part, by the success of Se Ri Pak, who recorded 39 professional wins — 25 on the LPGA Tour — including five major championships won between 1998 and 2006. She was inducted into the World Golf Hall of Fame in 2007 before retiring in 2016. Whan says the LPGA Tour is more popular among Koreans than the men’s PGA Tour, viewed as golf’s sporting and financial pinnacle. Thanks to this wave, the LPGA has “Korean sponsors sponsoring events in San Francisco,” explains Whan, an illustration of the country’s interest in the success of its many female golfers. Alongside Park, the likes of seven-time major winner Inbee Park, 2017 British Open champion I K Kim and So Yeon Ryu — who has two major victories to her name — are laying down a challenge for their competitors to meet. Inbee Park has grown accustomed to seeing Korean fans at golf courses all over the world and takes pride in what she and her compatriots have achieved in the sport. The 30-year-old believes the success of her and her peers has helped the women’s game supersede the men’s in Korea. “We have a lot of good fans in women’s golf, it’s bigger than men’s golf in Korea,” she told CNN. “So I think that explains a difference with other countries.